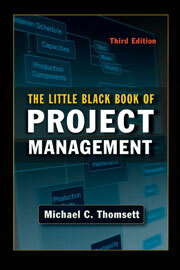 For nearly twenty years, The Little Black Book of Project Management has provided businesspeople everywhere with a quick and effective introduction to project management tools and methodology. The revised and updated third edition reflects the newest techniques, the latest project management software, as well as the most recent changes to the Project Management Body of Knowledge (PMBOK™). Readers will find invaluable strategies for: • Organizing any project • Choosing the project team • Preparing a budget and sticking to it • Scheduling, flowcharting, and controlling a project • Preparing project documentation • Managing communications • And much more A fast-read solution for both seasoned and first-time project managers, The Little Black Book of Project Management can help any professional achieve on-time results, superior organizational ability, consistent profit generation, and a reputation for both quality and dependability.